Is right or wrong a matter of perspective? When events confound me, I’ve learned to ask: under what circumstances would those events make sense? It’s a good question to ask when a competitor does something you’re tempted to dismiss as crazy. Or, when something you thought perfectly absurd becomes wildly successful. When change confounds your view of the world, it’s a good time to reexamine your view. Let’s play network television programmer. Weeknights at 10:30 central time: your competitors both air talk shows with funny bits and music acts. Instead, you air a news show that regularly beats the talk shows in the ratings. Obviously, the smart thing to do is replace that news show with yet another talk show featuring funny bits and musical acts. Sound nuts? That’s exactly what ABC has done by swapping around Nightline and Jimmy Kimmel. They’re giving viewers a choice of the same schtick on three channels. Genius. Under what circumstances does this make sense? Watch enough detective shows and you’ll learn: motive boils down to money or honey. That’s exactly the case here. 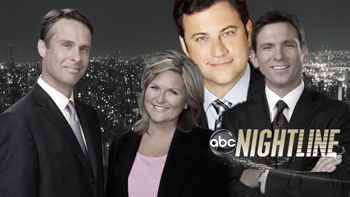 Consider the facts: TV Newser reports despite getting a generous contract extension, “Kimmel has wanted (Nightline’s) time slot since he started at ABC.” Jimmy made his terms clear: he gets the slot, or he takes a walk. Give him the love, or cut him loose. As for the money, ABC wagers Kimmel will make them more of it. Easy bet: Kimmel, already has a track record of shamelessly selling out his show for a buck. Nightline? Not so much. Once upon a time, the FCC licensed broadcasters as trustees of our public airwaves. News was part of the deal; broadcasters got their license if they promised to keep us informed. Media deregulation in the 80’s ended that deal. These days news has to turn a profit or perish. See it that way and the circumstances of this change almost start to make sense. Almost. Nightline’s ratings success is less about serious journalism than serving a diet of “pop news:” celebrity profiles, human interest, and the occasional hard story. Even so, it attracted more eyeballs than its talk show competitors. But, it didn’t matter because news can’t monetize the numbers like Jimmy can. Audience size isn’t the metric. Revenue is. As a result, we all lose as TV plays the short game for profit. But, at least now you can see how, to ABC, it makes perfect sense. Do you think it’s in ABC’s best interest to serve up more of the same just to put more money to the bottom-line? In this age of publicly traded corporate morality, perhaps. But, in the longer view, what this change really produces is a less-informed population. When you decide to cut a corner to add a penny’s profit, what’s lost is a slice of brand integrity. Then again, it all depends how you view the circumstances. UPDATE: In the months following the change, Jay Leno has continued to dominate the late night slot, partly due to curiosity tune-in among those seeking a glimpse of his final nights in Johnny’s chair. What’s more concerning for ABC, though, is Kimmel has not improved the overall ratings for the time slot over what Nightline had delivered there. However, from the perspective of revenue, I’m certain ABC is brining more to the bank with Jimmy than it did with Nightline. Point made. Great post! I see this a lot in reverse as well, where business owners do something to their Website because Amazon or Zappos did. Well, before you copy their moves, you had better look at both their context and their motives. If you have a radically different context and different business model, you might not be well served by copying this or that practice of theirs. Sort of your thing in reverse, where if you see a competitor doing something seemingly bizaar, the best thing to do is figure out what circumstances or motivations would end up making that move more reasonable or understandable. We’re all succeptable to attribute things to other’s idiocy or laziness — or to expert’s universal genius — but it’s usually worth the time to figure out alternative reasons.